Ben Lai: Welcome back. It’s Ben Lai from Sales Ethos, and I’ve got Dr. Rachel Abramson joining us again today. Ben Lai: So Rachel today, my question for you is; we talked about people charging what they’re worth. But how does that tie to the entrepreneurs’ self-perception, self-perceived value and their self-image? What is the correlation from a psychological point of view? And how can they change that? 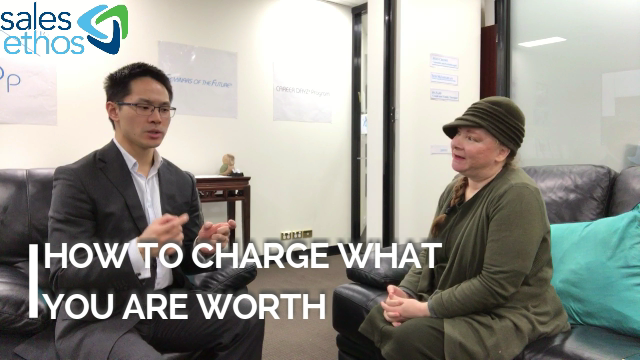 Dr. Rachel Abramson: If you have a good sense of self-worth or self-confidence, then you’re more likely to charge what you’re worth, than if you have a low sense of what you’re contributing and what you what your value is to your clients. Your employer’s… Whoever you’re providing a service to. So the first thing is to know who you are. To know what it is that you bring to the table; what you contribute to the other person or the other organization’s bottom line. And the more that you can see that, the more that you understand what you’re really worth and then you can price your fees or ask for remuneration that reflects that. Dr. Rachel Abramson: Can I just say something? Ben Lai: Oh yeah, absolutely! There is a real gender difference in putting yourself forward. Men are more likely to do that and I’m speaking on the whole not every male, but most men will respond like that. And in contrast, most women will hold them back. And that’s why I said an earlier video, if you’re a woman, increase your fees straight away. Five times, 10 times but increase them. And I don’t say that with men because men are more likely to price themselves more fairly than women are. On the flip side, if you need a professional service and you’ve got a male and a female that you’re considering, chances are you’ll get more value out of the woman, you’ll get more value out of the female provider than you will the male provider for the same fee. Ben Lai: Okay! No offense taken! Dr. Rachel Abramson: That’s just a gender difference in attitude about money and pricing. Ben Lai: Yeah, that’s totally fine. We are talking about generalities. But I think it does need to be taken on a case by case basis, you do need to consider all the factors and but yeah, certainly, you know, the women who go out into starting their own businesses. One of the things that I’ll admit as a man that’s the advantage that they have over us is the care factor. You know, they they’re by nature very nurturing and they have a very strong emotional attachment to your outcomes that they’re providing for their clients. So yeah, happy to admit you know that that’s the advantage that they have. So thank you for the very comprehensive answer on that question that’s some great insights especially for women. So what do you think? Do women have an advantage in business? And do they tend to undervalue themselves? And is this the cause of the gender pay gap? Let us know what you think in the comments below. Click Like and Subscribe and we’ll see you on the next episode. Dr. Rachel Abramson: Bye for now! 2nd Interview: Is Money Root of all Evil? This entry was posted in Business Coach Melbourne, Interview, Personal Development. Bookmark the permalink. Should Sales Professionals Use Profanity?